Situated just a few steps from the Sandton Gautrain station, the hotel is a business traveller’s dream come true. The Radisson Blu boasts of being literally a stone throw away from the train station as well as being a walking distance to all that Sandton business district offers, plus breezy access to the OR Tambo airport. Fast forward to me sitting down with you in the breakfast room surrounded by yummy food. The wide selection of eats at the Radisson Blu surpassed my expectations. The variety included all kinds of fruits on the fruit salad bar- even those currently out of season. I also noticed that they cater to the needs of those on the Banting diet. I must admit, this was not something I wasn’t expecting because not many hotels particularly business ones jump through such hoops. I found it quite special that the hotel goes to such lengths. It must give that homely appeal to any visitor on a Banting diet I think. If you are a carb lover, like many of us are, you certainly would enjoy the different selection of bread, cereals and muffins which are served up daily. Just as there are carbs to compliment the everyday Radisson Blu Gautrain hotel’s super breakfast, there are also plenty of delicious protein-rich foods. 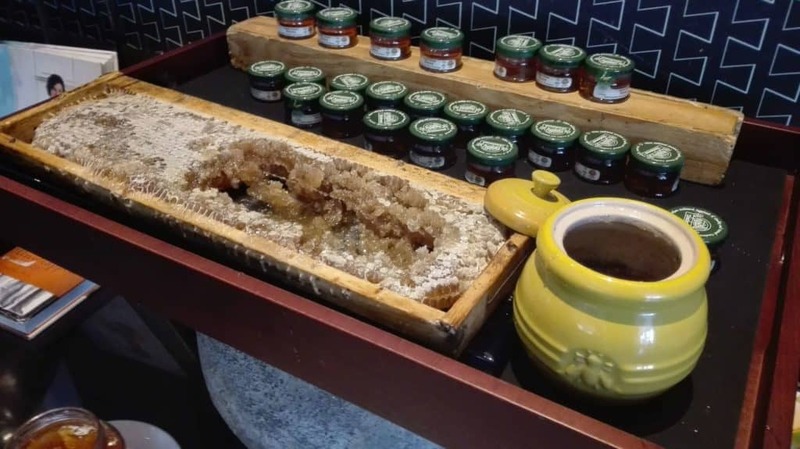 While most hotels offer natural honey, the Radisson Blu hotel has on a large platter, the purest form of honey- raw honeycomb. I tell you I was thoroughly impressed by this and the good number of organic jams. Beverages on offer include a wide selection of teas, coffees, smoothies, and my favourite for the day- the freshly squeezed juices. I sipped on a strawberry smoothie before I ordered my meal and also had a taste of the hotel’s smoked salmon. Both the smoothie and salmon were absolutely divine. Now on to my healthy breakfast experience. I walked over to the hot food bar to ask the chef what they had on the menu and was pleasantly thrilled to hear him say, “It’s not about what we have, it’s about what you want. Name it and we will make it happen for you”. Oh, I died a little just then and went straight to food heaven. It turns out, the chef – Tyrone Kleynhans- didn’t say this to please me because I am a blogger. This I found out was just the hotel staff’s everyday attitude. Apparently, Radisson Blu Gautrain hotel employees operate on a ‘yes I can’ philosophy- whatever the customer wants, the staff will find a way to provide it. to me and my healthy breakfast experience. I asked Tyrone to prepare for me a scrumptious Spanish omelette with vegetables and cheese and he swiftly served it up. I washed the omelette down with a freshly pressed orange juice which by the way I pressed myself at the juice bar. After breakfast was over, I was given a quick tour of the hotel by my host. I instantly regretted not having slept over. Most amazing was the modern, spacious and well-equipped fitness centre. Of course, as a fitness blogger, I go crazy when I see fitness equipment. I was itching to jump into a workout just then but unfortunately, I wasn’t dressed for it. 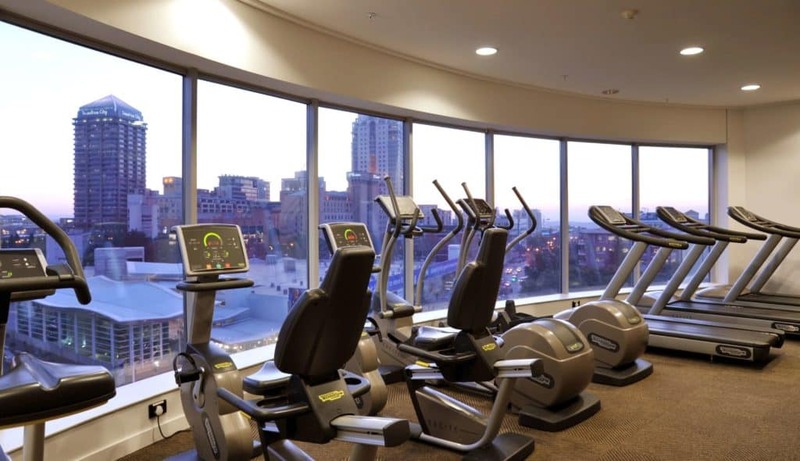 I didn’t get to have the fitness experience in a gym that has one of the best views Sandton has to offer but I suppose that will be an experience for another day. 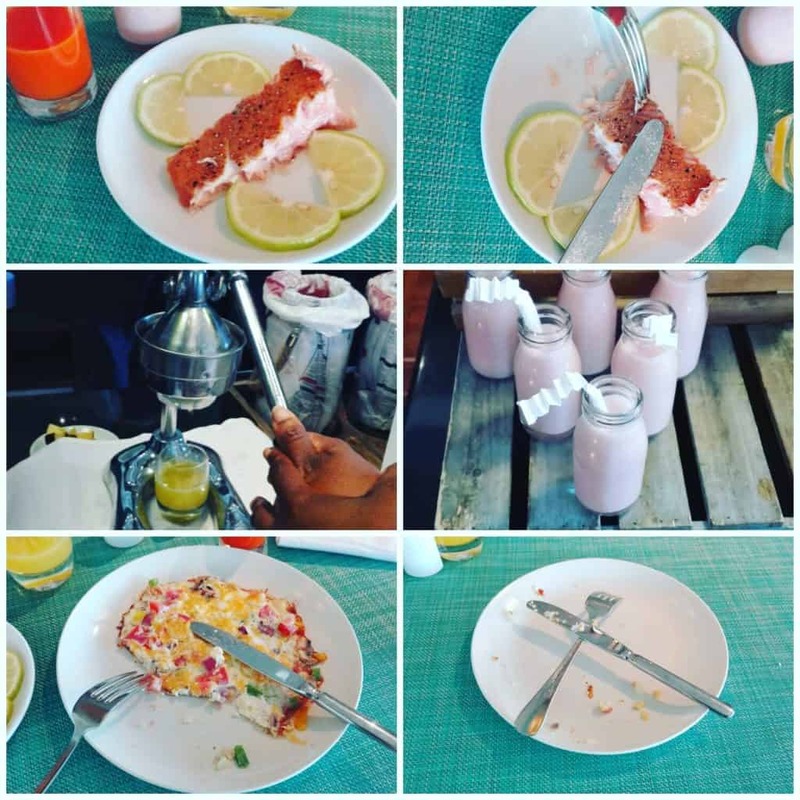 The hotel overall is worth staying at if you ever find yourself on a business trip in Johannesburg or if you are on a hunt for a mouth-watering meal topped with a friendly atmosphere. The beautiful terrace pool with its seating space is where I imagined myself to be writing this article. I sailed through the rest of the day with a burst of energy, all thanks to the Radisson Blu Gautrain hotel’s healthy breakfast experience. Have you ever been to the Radisson Blu Gautrain hotel? What was your experience? *I was hosted by the hotel. The thoughts shared in this article are my own. Wow what a place! that pool looks amazing and that view from the gym could even make me want to work out! I love the lavish buffet breakfast served at hotels or high-end restaurants. I’ve stayed at Radisson Blu hotel once in the United Arab Emirates and so also got a chance to enjoy the breakfast there, it was fantastic! That raw honeycomb is impressive! The Radisson Blu Gautrain Hotel takes their breakfast VERY seriously! I’ll be sure to keep this in mind in my future travels! 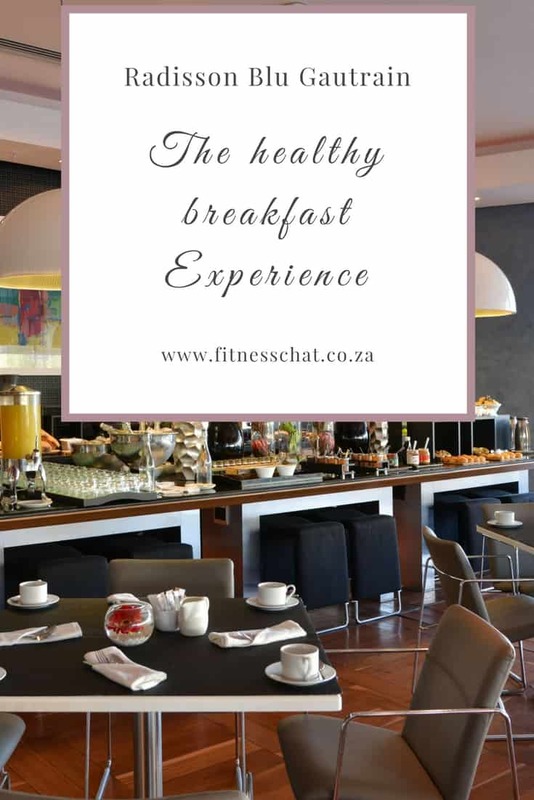 If I ever find myself in Johannesburg I would love to stay at the Radisson Blu Gautrain and have that amazing breakfast after a nice workout. That view from the workout room looks spectacular. Breakfast is my favorite meal of the day! I love a good healthy breakfast! I have stayed in different Radisson so many times! This seems to be no different. They deliver great experience. This place looks really nice! I would enjoy heading to the gym there, and my family would love the pool and food! I have never heard of the banting diet but it’s good to know that they have a Yes I can attitude and try to make the experience so wonderful. I have always had great experiences at the radisson. I could see myself staying here, it looks divine! It sounds like the perfect hotel to stay in especially when you’ve been wanting a getaway just for the weekend. I love that they have healthy food choices. I appreciate hotels that serve healthy food especially when it comes to breakfast. It’s really nice that you got to have such a good experience dining here! I’ve never stayed at a Radisson Blu, but I want to know. The view is insane and the food for breakfast looks amazing. I remember when the built a Radisson Blu in Chicago. I walked by there a few times and was in awe of how beautiful it looked. Next time I will have to book a night or two to take advantage of it all. This hotel looks so amazing and I love breakfast in hotels a lot. Nothing to worry about until lunch time, once that’s taken care of. Oh boy this looks like my kind of breakfast! And that honey?!! It doesn’t get fresher than that! Fresh honey is the best – you can practically taste the flowers in it! That food looks delicious and those amenities great! It’s hard to eat healthy when you’re away. The breakfast has so many options it is amazing. I wouldn’t even know what to do with that amazing honeycomb. I would totally enjoy myself at that wonderful hotel. A lovely breakfast i have stated at a few Radisson Blu’s and not been disappointed with the service or quality. Nice hotel. Wow this hotel breakfast looks amazing!! I have not seen a breakfast like that at one that I have gone to. What a great media event! I love good hotel breakfasts and it’s a great start for the entire family. It looks like an amazing hotel, and the breakfast looks fantastic! How awesome is it that they have raw honeycomb! This looks like it would be a great experience. I have never stayed at the Radisson Blu, but I will definitely be pinning this for the future! I love all the Radison Blu hotels they are always amazing and so jealous of that breakfast. I had seen the hotel on my recent trip to Johannesburg. Looks liek a truly wonderful hotel and experience. I love that pool. The view is amazing!